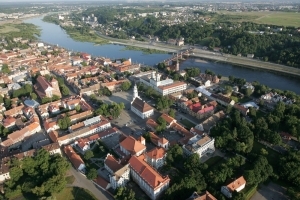 Kaunas is the second largest city in Lithuania with a population of over 306,000. The city is situated in the centre of Lithuania at the confluence of two longest Lithuanian rivers the Nemunas and the Neris. A lively student city with seven universities located in the heart of Lithuania, Kaunas is also known as the capital of Lithuanian basketball. History. 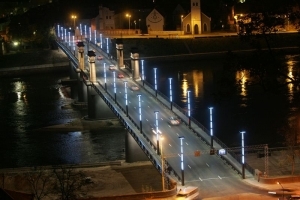 Kaunas has been developing for many centuries and experienced many ups and downs. The city and its castle were first mentioned in historical chronicles in 1361. Kaunas was a medieval trading centre and its stone castle served as an important stronghold against the forces of the Crusaders. In 1408 under the Grand Duke of Lithuania Vytautas the Great the city was awarded the Magdeburg rights acquiring the status of municipal autonomy. In 1795 Kaunas and a bigger part of Lithuania were subordinated to the Russian Empire for more than one century. Between the World Wars of the 20th century Kaunas was the provisional capital of a short-lived Republic of Lithuania. This interwar period was marked by prosperity and is considered the Gold Age of the city. During the Soviet occupation followed after the World War II Kaunas became the symbol of Lithuania’s statehood. Where past and present meet. The centre of Kaunas is divided into the Old and New Town. The Old Town is a remarkable archaeological monument and an architectural masterpiece incorporating Gothic, Renaissance and Baroque styles. It is a concentration of the ancient architectural monuments, such as the remnants of the 13th century stone castle, the impressive Town Hall, popularly known as the White Swan, and Vilnius street, a characteristic trade street of the Middle Ages. 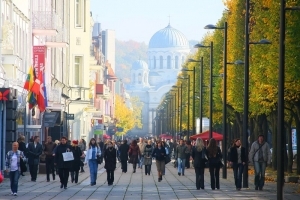 The New Town is represented by Laisvės Alėja, a central pedestrian street often called the “Heart of Kaunas” where numerous hotels, shops, restaurants, cafes, and bars are located. Cultural life. Kaunas has perhaps the largest number of museums and art galleries situated in a single city in Lithuania. M. K. Čiurlionis’ Art Gallery is one of the oldest and largest national museums attracting visitors with its unique collection painted by the famous Lithuanian artist and composer Mikalojus Konstantinas Čiurlionis (1875 – 1911). Kaunas also has eight theatres with a rich repertoire from historical to contemporary drama from national and international playwrights. Annual traditional and modern musical and show events make city life vital and colourful. The International festival Kaunas Jazz attracts renowned performers around the world. The admirers of classical music can enjoy concerts in Pažaislis Classical Music Festival that takes place in the surrounding of a magnificent baroque monastery. In the end of May towns people and guests come together to celebrate the birthday of Kaunas – Kaunas City Day. The annual three-day festival lights up the main pedestrian street from the New Town all the way through to the Old Town with fancy dress parades, street stalls, theatrical processions, concerts, fairs and other eye-catching events.